Choosing to light up your landscape is a great decision to make, but it becomes all the better when you decide to do it correctly. While working with a team of highly qualified individuals is, without a doubt, one of the best ways to ensure a job well done, it’s not the only element of your project that could affect how well your new lighting additions look. At the end of the day, the lighting fixture that you select and how well it’s installed will only make up two key components of having a quality lighting fixture added to your landscape. A factor that many forget about is the light bulb that is being used. LED bulbs have been around since the 1950s, but they didn’t really gain popularity until around 2014 when a white LED bulb came around. It was at this time that the energy saving benefits of the bulb were, for lack of better words, brought to light. While energy conservation is one of the major benefits, there are countless others that you benefit from when choosing to use an LED light in your space. 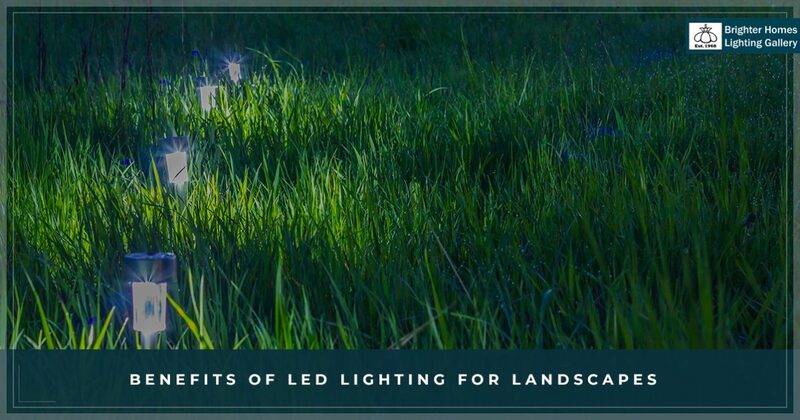 Keep reading to discover a few of the major benefits in regards to adding an LED bulb to your landscape lighting. Having to switch out your light bulbs regularly can get exhausting, and expensive. If you’re tired of this task that investing in landscape lighting has sprung upon you, then it’s worth looking into LED bulbs. These bulbs are known to last five times longer than the standard halogen light bulb. When LED bulbs first came out, there wasn’t a ton of option in regards to the brightness that you were able to select. In fact, most people strayed away from the use of LED bulbs because they were only going to get a faint light at best. Needless to say, that isn’t what all want out of their landscaping lighting. The good news is that you’re now able to choose from a wide range of brightness options so that you can find the perfect lighting option for your needs! A major concern with adding light fixtures to a landscape is the amount of insects that it can draw in. From moths to mosquitoes, it’s not exactly ideal to be a visible target for these pests. If you’re especially concerned with the possibility of attracting insects to your home with lighting fixtures, LED lighting may be the solution! Not only are these bulbs a sound way to brighten up the exterior of your home, but they don’t emit UV light, which is the key reason that insects are attracted to light in the first place. So when it comes to your outdoor lighting needs, LED bulbs really are the only way to go. As we mentioned earlier, obtaining the perfect landscape lighting is only possible when you’ve truly mastered the combination of quality lighting fixtures, knowledgeable professionals doing the installation, and wonderful bulbs lighting up the place. Now that you’ve learned more about the benefits of LED bulbs, it’s time to find the right lighting solution! Contact the team at Brighter Homes Lighting Gallery in Eugene to schedule a consultation with a member of our team. We’ll listen to your lighting aspirations and make them a reality!